At first glance, Cowfold would seem to most to be a quiet place with perhaps not too much going on. But look again – behind the reassuringly heavy red doors of the Village Hall, there is a positive hive of activity! 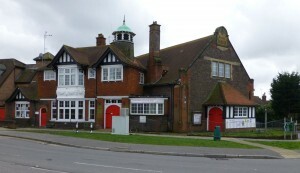 The Hall was built in 1896 and is located in the centre of the village at the junction of the A272 and the A281. Donated to the village many years ago by Frederick Du Cane Godman, it is managed by the Village Hall Management Committee with the Cowfold Parish Council as the Custodian Trustees. Over the years, it has provided a versatile meeting place for all manner of groups and events. A sneak peek inside the bookings diary reveals just what a thriving and sociable community exists here. The Village Hall caters for age groups from as young as new-borns right through to those who receive birthday cards from the Queen! Current sports users include KB Fitness, which, amongst other activities, provides the village with an over 50’s exercise class. Short Mat Bowls is very popular and perhaps the Dog Training classes should come under the category of ‘extreme sport’! Cowfold Football Club can be seen in ‘match action’ most weekends during the season and hold various fund raising events, including quiz nights, in the Main Hall. At one time, a badminton club used the Hall; hopefully this may resurface in the future. It is certainly an ideal venue with its high ceiling and solid oak flooring. Of course, if you prefer a more leisurely approach to your socialising, why not contact the Bridge Club or the Cowfold History Society or the Horticultural Society to check out when they meet? Still not found your niche? Maybe attending Women’s Institute or Royal British Legion events would be more your cup of tea? Talking of tea – you should definitely look out for the Friday Café run by St Peters Church every Friday morning in the Reading Room. The Church holds various fundraising events in the Hall from Barn Dances to Jumble Sales and Christmas Fairs. In addition, the Weald Community Church-meets regularly for worship on a Sunday. Some people regard gardening as a spiritual pastime; Cowfold Horticultural Society members have regular meetings in the Main Hall with speakers shedding light on various aspects of gardening. But use of the Hall is not limited to the residents of Cowfold – although if you are a resident you will benefit from discounted hire charges! A recent addition is the Surestart Children’s Centre now located here, which provides advice and support to parents and carers of pre-school children. Commercial hirers have sold furniture, carpets and all kinds of crafts from within the 115 year-old walls – if only those walls could talk…I bet they’d have some stories to tell! 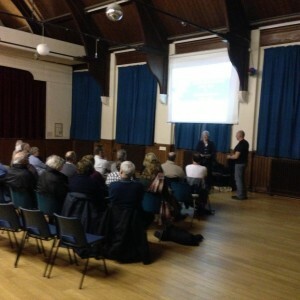 So, the Village Hall provides a central meeting place for many varied activities in Cowfold! If you want to join or start up a new club, attend the Parish Council Meetings or simply hold your own private party, complete with glitter ball, disco lights and stage lighting – this is the place to do it! For more information about the facilities, conditions of hire and charges, or just to discover how you can get involved and help us to keep this invaluable asset at the centre of our community, please contact John Chamberlin on 07774 970302.